SONY RX100 V Camera Covers Specification, Design, Price, Features, Etc. SONY RX100 V Camera – camerausermanual.net. The world of photography has been evolving periodically. In the past, people might be interested in Bulky camera with various of controls and panels on it. This is when DSLR kind of camera was placed on the top of the food chain. But currently, this thing is slowly changing. The heavy weight and complex setting force people to think “impractical” is the best word to describe this kind of camera. And this is where people started to move to the more compact imaging device. Apparently, this was sensed well by SONY. To fulfill the customer needs toward compact and point-and-shoot picture capturing device, this Japanese electronic manufacturer just released SONY RX100 V camera couple weeks ago. SONY RX100 V camera is the newest series of SONY’s Cyber-Shoot RX camera. With sophisticated features and nicely done appearance, this SONY’s imaging tool has been succeeded in attracting the eyes of photographer around the world. So, it seems not too much if we label this camera as world’s fastest continuous shooting device. Further, the title of world’s most AF points of compact camera and world’s fastest AF speed imaging product is also deserve to be labeled on it. So, what makes this camera deserve to get these titles? Here is the explanation of it. Before getting further into the specification of SONY RX100 V camera, let’s talk about the appearance of it first. Talking about look, SONY has been known as the master of design since a long time ago. Not only for camera product, but other SONY’s electronic products are also features with great deal of design. So, there is no wonder if this camera has a high aesthetical value. From the outside, SONY RX100 V camera looks solid with its boxy design and metal body. There is not much accents around the body, makes it looks simple and classy. About the size, apparently SONY didn’t give this product many differences with its predecessor especially on the body dimension. Overall, it’s still pocketable with tolerable weight which is about 299 g.
This is the weight when the battery and card are included. Further, the controls are also reachable, so it can be accessed by your fingers easily and comfortably without taking too much effort. On the backside of the SONY RX100 V camera, you will find 3-inch LCD screen. This LCD screen has 1.23-million dots with multi angle features. Here, you can view the result of your shooting activity in clear and bright image quality. This LCD screen can be tilted upward. So, we can guarantee that selfie lovers will definitely like it. Moreover, for you who like conventional shooting sensation, you can employ the pop-up viewfinder on the top of camera. This is the viewfinder that comes from OLED electronic with 2.36 million of dots. Nicely done out-case means nothing without good specification inside. This is why the manufacturer put a concern on the SONY RX100 V camera insiders. Comes with 20.1 MP Exmor RS BSI CMOS 1-inch sensor, this camera is able to take 24 RAW images in a single second. And for you who like to capture your moments in moving picture, this sensor is already able to shoot video in 4K format at 30/24 fps. Further, to increase the quality of shooting result, this camera is already completed with Anti-Distortion Shutter that has 1/32000s of maximum speed. This feature will definitely help you in minimizing the effect of rolling shutter while at the same time capturing sharp image. So, you will be able to take image with high brightness level, up-to EV19, with wide-open aperture. In the lens sector, SONY has chosen ZEISS® Vario-Sonnar T* to be the main part of image-taking device. This is the lens that equivalently similar to the 25-70 mm and f/1.8-2.8 in 35 mm of terms. Furthermore, as the fastest AF camera in range, SONY has planted Fast Hybrid AF System. This system has 0.05 AF speed with 315 points. And to support all of these functionalities, this stylish camera uses BIONZ X image processor, which specially designed for fast AF camera. With this processor, the camera is able to achieve 125-12800 ISO Range, which is expandable to 80-12800 ISO Range. Find more information about this camera in official SONY website here. Before getting ti the price and impression, to give you the clear vision of this SONY RX100 V camera, here we enclose the videos introduction and review of this camera. From these video, you will be able to get more real picture of it. Further, the information regarding to the features, operation, specification, and what to expect from this camera will be able to obtain too. These videos come from the official account of The Art of Photography and CNET on Youtube. They are the accounts that specialized theirself in reviewing digital camera product. So, if you are interested to this camera product, the videos below will be the best reference to take. Overall, this SONY RX100 V camera is such an amazing device with high capability of capturing pictures. The design is also nicely done, and the dimension is comfortable to be hold. With the addition of WiFi and NFC technology, you can share the result of your capture instantly to your personal device such as Smartphone, laptop, and tablet. 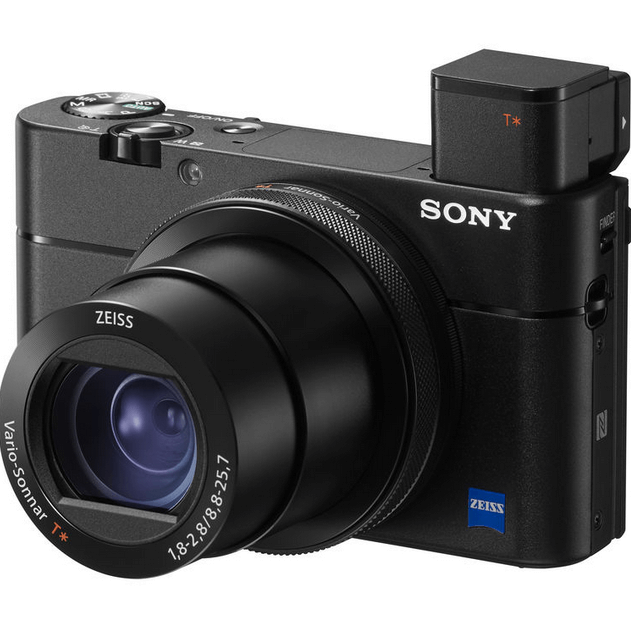 While talking about price, this cool SONY RX100 V Camera can be afforded since the beginning of this October by 1000 USD of price. So,what are you waiting for? Go grab this camera and feel the fast AF sensation.